Crunkleton’s Top 5 From 2017! It’s been a big year for the City of Huntsville! New developments were announced, businesses opened their doors, and exciting events happened that made 2017 an unforgettable year. At the end of each year, we take a moment to share the major announcements that YOU viewed the most on our blog. Thank you to everyone who helped make this past year so special. As you can see from the list, it looks like everyone was very excited to welcome several new restaurants to the Huntsville area! At Crunkleton, we try to highlight the amazing history behind different buildings in the city. Our Historic Huntsville posts have continually been a favorite of our readers, and this year we uncovered the history behind the Yarbrough Hotel in Downtown Huntsville. Mary Jane Caylor, a well-known Huntsville figure dedicated to restoring the downtown area, took us on a grand tour and shared personal stories of her childhood at the marvelous hotel. 5. Tenant Announcement! Scout & Molly’s Boutique Coming To The Avenue! Scout & Molly’s Boutique officially opened its doors at The Avenue this fall. We interviewed Lori Mullins, owner of the downtown shop, about what makes the women’s boutique so special. 4. Chuck Wagon Texas BBQ Expands To South Huntsville! After 10 years of success at its Madison location, Chuck Wagon Texas BBQ will open a second restaurant in South Huntsville at Redstone Ridge Shopping Center! The soft opening of the new location is tentatively scheduled for January 4, 2018. We spoke with owner Stephen Holley and got a sneak peek of the new barbecue joint. If you’re looking for authentic Korean fare, Haru is the place for you. Located in the Spencer Square Shopping Center, visitors can now find the city’s newest Korean restaurant serving up everything from noodles and soups to sushi and spicy chicken. 2. “Baby Bite Bake Shoppe” Announces New Huntsville Location! 1. New “STOVEHOUSE” Development Coming Soon To West Huntsville! Our number one blog for the year goes to our STOVEHOUSE announcement! If you haven’t heard, the historic Martin Stove building, located at 3414 Governors Drive, will soon become the site of the city’s next large-scale food, office, events, and entertainment complex. A 200,000 square foot building situated on a 10-acre property, STOVEHOUSE will blur the line between modern and historical, work and play, and small-town culture and high-tech urban energy. We have several more announcements for STOVEHOUSE to come, so be sure to check back on our blog for more updates as this project evolves. Again, thank you to everyone we interviewed to make these announcements possible. And of course, we owe a HUGE thank you to our readers. 2018 is looking to be another great year, and we can’t wait to share our journey with you and continue to highlight exciting news and developments in the Rocket City! It’s time again for another “Huntsville Speaks” where we ask for feedback from the community on what YOU want to see come to the Rocket City! Your input matters, and that’s why we continue to ask you what it is you’d like to see and enjoy in Huntsville. You speak, we listen—and we go out and try to make it happen! 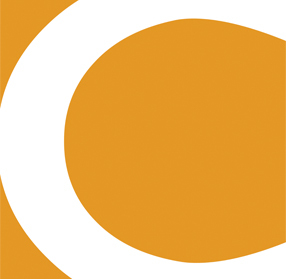 This time, we are asking everyone to weigh in on our latest big announcement: STOVEHOUSE. Not only will this development be home to the city’s first urban food garden, but it will also include a rooftop wine bar and plenty of space for events—big and small! We’d love to hear YOUR ideas on what restaurants and eateries you’d like to see in this one-of-a-kind historic space. We are looking for unique, regional concepts. Is there something in Birmingham, Chattanooga, Atlanta, or Nashville that you’d like to see here? Comment below and let us know! Need a little help brainstorming? Here are some examples of what could be fitting for this space. Are there concepts out there that feature cuisine from a specific region that you’re passionate about? Restaurants that serve up favorites from around the world are always a popular choice. Döner kebab, dumplings, falafels, pierogies, gyros, ramen—there’s a lot out there to choose from! Are you ruled by your sweet tooth? When we see shops that serve cookie dough, specialty ice cream, macaroons, and pies, we can’t help but want them nearby. What kind of dessert shops would you like to see at STOVEHOUSE? Restaurants like Mason Dixon Bakery & Bistro have seen a lot of success in Huntsville because they offer incredible fare for customers with gluten allergies or other dietary restrictions. There are a growing number of options in the culinary world for vegans, vegetarians, and people who prefer to eat organic or local. Would you like to see more restaurants like this in Huntsville? If so, which ones? Those are just a few ideas to get your creative juices flowing. What restaurant concepts do you want to see at STOVEHOUSE? Comment below and let us know! Or send us a direct message on Facebook or Instagram. We are listening. Last year we started a new feature on our blog called “Huntsville Speaks,” and we’re back again for more community feedback! We believe our city should be shaped by the people who live in it, that’s why we want to hear what you have to say. You speak, we listen, and then we go out and try to make it happen! Any good Downtown worth its salt is always filled with a variety of retail shopping, dining and entertainment options. Well Downtown Huntsville is growing by leaps and bounds with additions like The Garage At Clinton Row and The Avenue providing much needed retail and dining to the area, but what about entertainment!? That’s why we’re working right now to help fill the gap and solidify that final piece of the downtown puzzle, but we need your help finding out what entertainment options you’re looking for in Downtown! Do you want to go see cult classic movies? Go bowling? Shoot pool, or maybe catch indie music show? Now it’s your turn! What entertainment options do you want to see come to Downtown Huntsville!? Earlier this year we started a new feature on our blog called “Huntsville Speaks,” and we’re back again for more community feedback! Do you have that one small local shop that you’ll drive 100 miles to visit because it’s just THAT GOOD!? We want to hear about it! And just to get the ball rolling we’ll share a couple of our favorites to start, then it’s your turn! 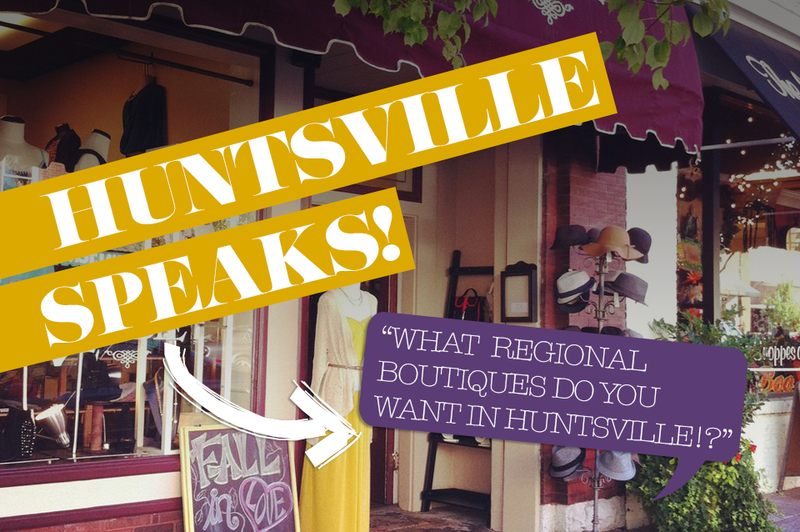 Leave us a comment and let us hear which regional boutiques YOU want to see come to Huntsville! Now it’s your turn! What regional boutiques do you want to see come to Huntsville! ?